Why would the owner of a mobile storage business call on contractors? What does construction have to do with mobile storage? Actually, a lot. The construction industry could be another revenue stream for your mobile storage business. The construction industry is in a growth mode. The newly elected administration ran on, and is following up on the campaign promise of proposing a $1 trillion infrastructure plan over 10 years. This and other positive factors suggest construction expansion has room to proceed. According to Dodge Data and Analytics, for 2017, total construction starts are forecast to rise 5% to $713 billion. Gains of 8% are expected for both residential building and nonresidential building. The pattern of construction starts by more specific sectors is the following: 1.) Single family housing will rise 12% in dollars, corresponding to a 9% increase in units to 795,000 (Dodge basis). 2.) Commercial building will increase 6% on top of the 12% gain estimated in 2016. 3.) Institutional building will advance 10%, resuming its expansion after pausing in 2015 and 2016. 4.) Manufacturing plant construction will increase 6%, beginning to recover after steep declines in 2015 and 2016 that reflected the pullback for large petrochemical plant starts. 5.) Public works construction will improve 6%, regaining upward momentum after slipping 3% in 2016. Money can be made offering containerized or mobile storage solutions to these construction projects.Construction companies on site use these containers for storing tools for different trades, as well as storage for long lead items or critical construction materials.This saves each trade from having to haul their tools daily to and from the construction site. The size and type of storage containers will depend on whether the project is residential, industrial, or commercial.The owner of STORsquare, a mobile storage company in Atlanta that has vast experience in residential projects, says they use the standard 20’ “white box” in residential settings because they have a more attractive appearance and are sturdy enough for that function. The 20’ ISO steel shipping containers are more appropriate for use in industrial or commercial projects because they are built tougher, suitable for heavy equipment and tools used at those type projects.The ISO containers can handle more wear and tear, as expected on industrial and commercial projects.The average shipping container lease rate varies depending on the size of the container, but for a 20’ container can range between $100 to $200 per month.Some mobile storage companies will charge a delivery and pick-up fee depending on how far away they have to take the container and how easy it is to place the container on the job site.The average rental period on a job site is about 4 to 6 months for residential jobs and up to 1 to 3 years on very large industrial or commercial projects.Depending on how much you paid for your container, one job could easily cover the cost of the container, resulting in pure profit after that job. Once a container is on a project the mobile storage company rarely has to move the container. How Do I Find Construction Companies Interested in Mobile Storage Containers? If your area of the country is lucky enough to have a booming construction expansion, it is easy to find leads. Every job site, whether residential, industrial, or commercial, allows contractors to place a sign at the job site. Contractors want to advertise that they are there working on that particular project and have work. If you ride through a construction site you can jot down names of the contractors working that particular project. Some companies will even arrange for job site rentals at the corporate level. To find out how container rentals are handled, a Google search for the company’s name with phone number can help you find the person in charge of that particular project at the home office. If you discover the job site handles containers, a quick stop at the contractor’s job site trailer can put you in touch with the correct person. It takes a little effort but will be well worth the effort financially. Interested in a Mobile Storage Business Opportunity? Contact Us! 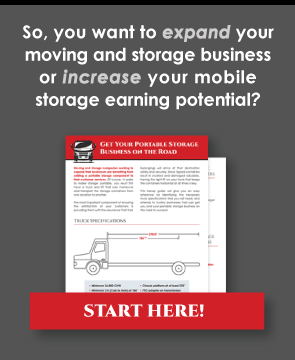 Are you interested in starting a mobile self storage business? Our patented storage container liftsystem can adapt to different storage containers from various manufactures, helping you move mobile storage containers, easier. Contact us today!